Through cutting edge innovation, Vespula presents a knife that will excel your lifestyle and make other knives obsolete. Bring this state of the art knife anywhere like hunting, fishing, camping, and hiking to witness the power of the Skinner. 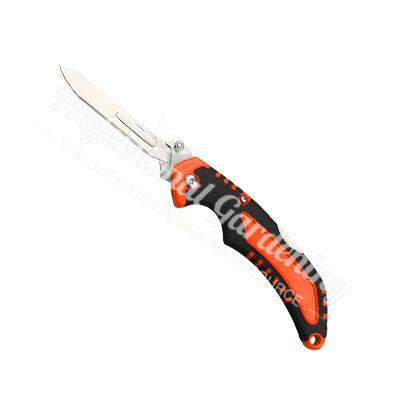 Blade length is 2.75" (69.85mm). Package includes: 2 additional stainless steel #60 SS blades and a holster. HUNTING: The Skinner gives you a extremely sharp surgical blade that is specifically designed for skinning and dressing game animals. FISHING: A fisherman's best friend. The Skinner makes scaling and gutting second nature. Let the knife do the work, and enjoy fishing again. CAMPING: Make the Skinner your go-to utility when you are enjoying the great outdoors. Your safety and reliability comes at ease to the Skinner. HIKING: Through those difficult terrains and unexpected moments, the Skinner is a knife you can rely on to get you through your journey.